The House voted 21-19 today to pass finally pass the operating budget, just two weeks after the budget made its first appearance on the House floor. The budget emerges from the House historically late in the session at day 77 of the 90-day regular session. The Senate has already scheduled hearings for the legislation starting tomorrow and continuing through the week with public testimony sessions scheduled for Friday. The House budget seeks to spend $3.9 billion of undesignated general fund spending on agency operations–including an $19 million increase to the University of Alaska–and a little more than $1 billion on a $1,600 PFD for Alaskans this year. Some of the key changes in spending from the governor’s proposed budget are lower in this article. The full undesignated general fund spend for the budget is $4.46 billion when including the state’s annual debt service payment, state retirement system payments and other non-agency spending. The total budget when including spending funded by federal money or program receipts, and the PDF comes to $10.1 billion. The legislation faced more than 80 amendments on the floor that were mostly offered by the minority House Republicans. Those amendments consumed much of the first week on the budget even though many either were tabled or ruled out of order. The second week was thanks to an amendment by a faction of the House Majority Coalition. Last Monday, that amendment was approved on a caucus-busting 21-19 vote that set permanent fund dividend payouts at $2,700–fully funded according to state law. On Friday–out of concern about the reality of such spending–the amendment was undone and the $2,700 PFD was replaced with a $1,600 payout. Today, debate on the operating budget was relatively quick compared to the glacial pace of the last two weeks. Only a few majority members spoke in favor of the budget, while many minority Republicans used it as one more opportunity to complain about the treatment of their amendments and the lack of significant cuts made to this year’s budget. The House, as expected, came up short of the 30 votes needed to approve a withdrawal from the Constitutional Budget Reserve with a 21-19 vote. The House Majority Coalition attempted to take care of the CBR vote earlier in the session with a bill that would have early funded education, but the minority House Republicans refused to give up their vote at the time and the Senate has seemingly sidelined that plan altogether. The budget also marks the first time the state will use money from the earnings reserve account of the Alaska Permanent Fund to pay for government. About $1.7 billion from the account will go to pay for government, and $1.02 billion will go to pay the $1,600 PFD. It amounts to a 5.25 percent of market value draw on the Alaska Permanent Fund. The budget now heads to the Senate with less than two weeks left in session. Two members of the House Majority Coalition cast votes against the budget at various points on Monday. 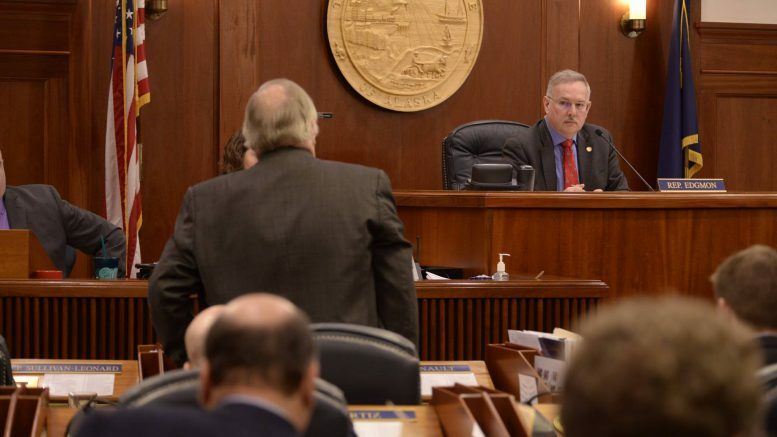 Rep. Gabrielle LeDoux, R-Anchorage, cast a vote against the operating budget itself and Rep. Sam Kito, D-Juneau, cast a vote against the constitutional budget reserve withdraw (which was expected to fail). Both votes would normally land a legislator in hot water with their caucus because caucus membership typically binds its members to voting for the budget. Two Republican senators–Mike Dunleavy and Shelley Hughes–left the Senate Majority last year after voting against similar pieces of the budget (Sen. Mike Shower, who replaced Dunleavy, refused to join the majority at all over the vote requirement). But both Kito and LeDoux will be able to hold onto their status in the House Majority Coalition, along with their staff, office spaces and committee memberships, because the coalition is non-binding (which isn’t to say there isn’t lingering ill will over the votes). Since nearly everything in the budget is measured in terms of undesignated general fund dollars, here’s a breakdown of most every UGF budget line changed in the House budget. Cuts $27 million debt repayment tied to not-yet-passed bills that would pay back oil tax credits. 2 Comments on "The House has finally passed the operating budget. Here’s how it’s changed." Vitamin D(uh)? Almost $500,000 for this? It seems Rep Seaton has already done enough studies on this himself. We all know we need vitamin D…So why waste more money studying it further! !